Portsmouth striker Kal Naismith is happy to be involved in chasing a potential League Two automatic promotion place for his side. Former Rangers player Naismith, 25, scored his third goal in as many games in a win at Hartlepool on Saturday. He found himself out of favour at Pompey at the end of last season, but has netted nine league goals this term. "I'm producing and doing what I need to do," he told BBC Radio Solent. "It feels good to play for this club." Naismith was given the option to leave Portsmouth last summer at the end of his first season at Fratton Park, which included a loan spell at Hartlepool. 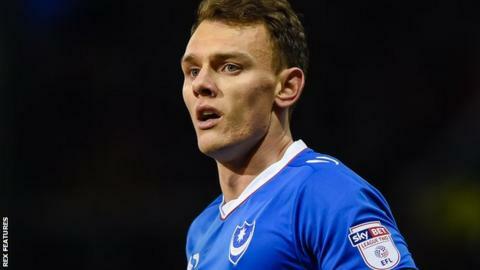 Having previously secured a promotion with Rangers from the Scottish Third Division, he said a second one of his career with Pompey would rank higher. "No disrespect to the teams in that league, but it's not as good as League Two and this would be a bigger promotion," he said. Third-placed Portsmouth have a six-point lead over Stevenage in fourth with six games to play, but Naismith is refusing to look too far ahead. "I know it's an old cliche, but's it's game by game," he said. "We've built up momentum quickly, but you can just as quickly lose it in football."